In a recent previous post and even in a magazine article, I wrote that in the month of August, turf machinery be washed extra clean, polished even, and a national flag tied to the machine; not merely as a show of patriotism but more so that the machine operators take a little bit more care for their machine instead of just hosing it down at the end of the day, every day. Why August? Because coincidentally, the National Day of Singapore, Indonesia and Malaysia fall in this month and many of my readers are from this region (WordPress allows me to trace the country of origin of readers). Yesterday I happened to visit one of those golf courses that did this. The superintendent told me how he picked a Saturday afternoon when most of the machinery were back at the workshop and called for a staff meeting. After the usual briefing, he told them about the programme and gave them time to wash their machines. One operator, after vigorously washing his machine, found that he could not tie the flagpole to the machines’ roll-over bar because the roof was wider than the bar and there wasn’t any other place to tie the flag. Guess what he did? He dismantled the roof and tied the flag to the roll-over protective structure. He was willing to not have a roof for a month (the superintendent will take the flags back after Malaysia Day on 16th Sept) just for the flag. And he’s not even a Malaysian. He took off the roof so he can tie the flag. The superintendent told the bunker-rake machine operator that he need not worry about his machine because it was too small and too old to clean up. The staff member protested, not only did he wash his machine extra clean, he took some paint and painted all the metal parts of the machine – dozer blade included, black. 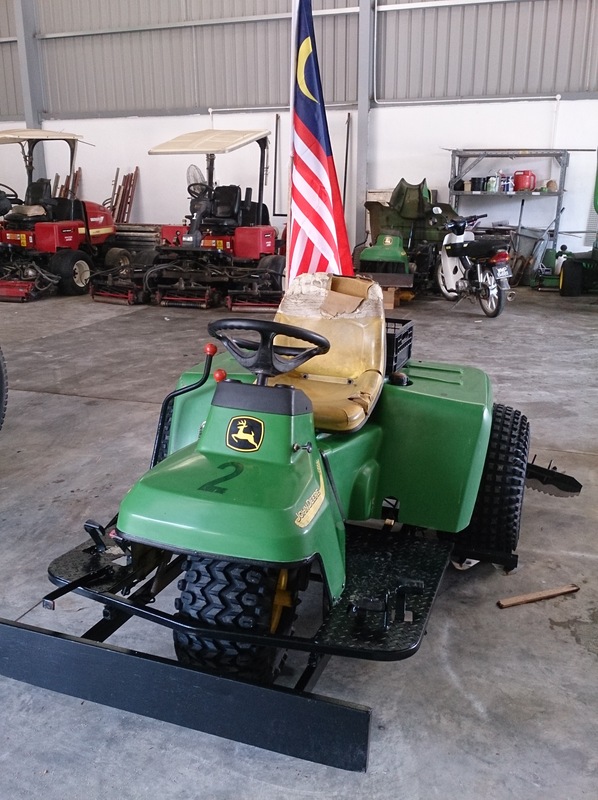 The superintendent gave him a flag which he proudly displayed on his machine. And he’s not even a Malaysian. He painted the metal parts black so that he can be allowed to put the flag. The point is not about the flag but the effect that the programme had on the workers: they owned the machines. Suddenly it is ‘my’ machine and I want my machine to be the cleanest it can be because I want to put on a flag. Follow up this with a training on how to look after the machine and I’m sure the machine will last a little bit longer with less maintenance stress as compared to a machine that did not ‘belong’ to anybody. I mean, “who washes a rented car”? I got that quote from a book I read about 25 years ago titled ‘In Search of Excellence’ written by – if I am not mistaken – Tom Peters. An example he gave was the ground crew chief of a squadron of jet fighters that had the best maintained planes compared to other squadrons. The crew chief’s secret was, instead of a crew looking after the right wing, another one looked after the left wing, one looking after the cockpit and so on, he gave them all each a plane to look after. One crew, one plane. “How did that work in creating excellence?” he was asked. His answer was that because each one of them now ‘owns’ a plane, they had a greater sense of pride and responsibility to that particular plane of theirs. “After all” he said “who washes a rented car?” I might be paraphrasing because hey, it has been about 25 years ago but I believe the gist is there. I also believe the credit should also go to the crew chief for his innovativeness and in this context, the superintendent for his role in firing up the workers. I mean, if he had sat in his office and gave the flags to the supervisor who would give the flags to the mechanic who then gave the flags to the operators; the effect would not be the same. So what worked? Maybe it was his speech, maybe it was the look in his eyes, maybe it was because he helped wash a few machines, maybe he held a big stick, maybe he promised them a reward or maybe it was already a culture in that place, whatever it was, it got the result that he wanted. It was actually more than I imagined, I can tell you that. 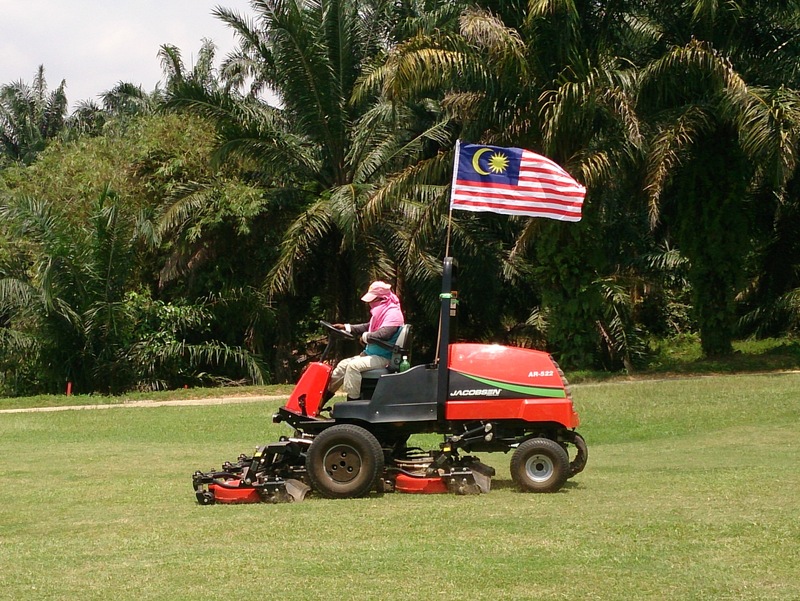 Its still not too late for Malaysians, at least, because the flags can remain on the machines till 16th September which is Malaysia Day. The cheapest flags I found was at Mr. DIY (biar kami rugi asal anda puas hati) at RM2.50 each. Or we can try and do something else. Or we can try finding one excuse or another to not do anything and complain about everything. It is a choice. Up to us. This entry was posted on August 19, 2015 at 9:20 am	and is filed under Golf Course. Tagged: general manager, Golf club, golf course, golf course maintenance, golf course superintendent. You can follow any responses to this entry through the RSS 2.0 feed. You can leave a response, or trackback from your own site.